Great New Price on this lovely PARTRIDGE RIDGE two story featuring formal rooms plus a large sun-filled kitchen/den combo, and an extra large MAIN LEVEL BONUS/REC room with attached full bath. Other main level features include a pantry/mud room, a powder room/half bath, an over sized 2-car garage with heated and cooled workshop, a covered front porch, and multilevel rear decking off the family room and bonus rooms. Upstairs you&apos;ll find 5 spacious BRs, 2.5 more BAs, a craft room or sitting room off the master, a laundry and folding area. Family and friends will love this private, level, fenced yard that&apos;s perfect for entertaining! 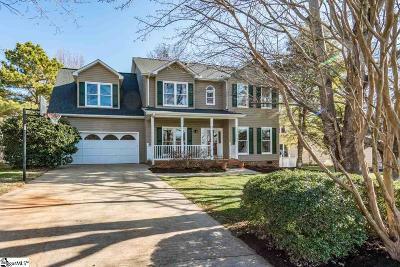 This LOCATION IS AWESOME with a neighborhood pool, 2 easy access routes to the Swamp Rabbit Trail, and an easy walk to beautiful Furman campus with its lake and many amenities. What&apos;s more--it is only 4 miles to Travelers Rest; 3.5 miles to Cherrydale theaters, shops and restaurants; and only 5.5 miles to downtown Greenville. Call today for a private showing..